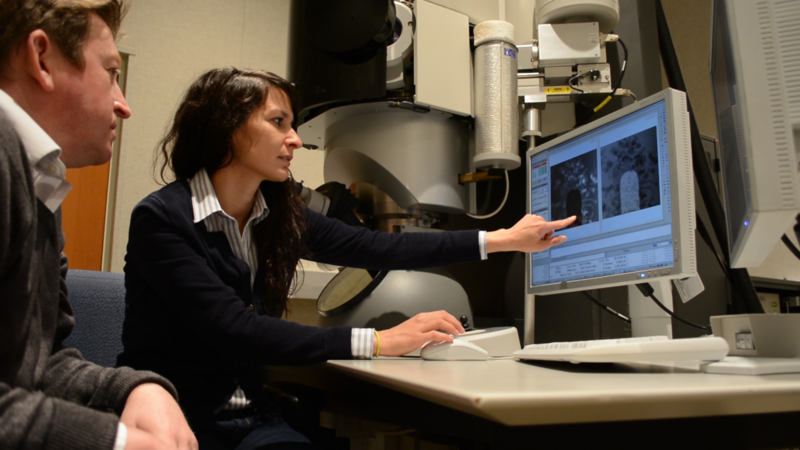 PNNL scientists Nigel Browning and Layla Mehdi examine images from a scanning transmission electron microscope at EMSL outfitted with a battery cell stage that lets them view multiple cycles of rechargeable battery use under real-world conditions. RICHLAND, Wash. — An eruption of lithium at the tip of a battery's electrode, cracks in the electrode's body, and a coat forming on the electrode's surface reveal how recharging a battery many times leads to its demise. Using a powerful microscope to watch multiple cycles of charging and discharging under real battery conditions, researchers have gained insight into the chemistry that clogs rechargeable lithium batteries. The work, appearing in the March issue of the journal Nano Letters, will help researchers design cheaper and more powerful rechargeable batteries with metals more common and safer than lithium. "This work is the first visual evidence of what leads to the formation of lithium dendrites, nanoparticles and fibers commonly found in rechargeable lithium batteries that build up over time and lead to battery failure," said lead scientist Nigel Browning, a physicist at the Department of Energy's Pacific Northwest National Laboratory. A special microscope setup shows the inside of a battery as it charges and discharges. As anyone with a dying cell phone knows, it would be nice if rechargeable batteries held more power, lasted longer and were cheaper. Solving these problems could also make electric vehicles and renewable energy more attractive. Using metals such as magnesium or aluminum in place of lithium could improve batteries life and cost, but research and development into non-lithium rechargeables lags far behind the common commercial lithium ion ones. To speed up development of rechargeable batteries, DOE funded the Joint Center for Energy Storage Research, a collaboration of several national labs, universities and private sector companies. Multidisciplinary teams of scientists explore a variety of problems, hoping to overcome them by understanding the underlying chemical principles. For instance, rechargeable batteries suffer from the growth of dendrites, microscopic, pin-like fibers that afflict battery electrodes. Recently, JCESR researchers led by PNNL discovered a way to eliminate dendrites in lithium batteries by using a special electrolyte. To better understand how dendrites form and can be prevented at the microscopic level, another JCESR team led by PNNL's Nigel Browning devised a microscope that could examine a full working battery in action. Unlike other views of the inner workings of batteries at high magnification, most of which use only part of a battery or have to study them under pressures not typically used in batteries, the Browning team created a complete functioning battery cell under normal operating conditions. "This is very exciting work," said first author Layla Mehdi. "We constructed a real working battery inside the transmission electron microscope. The advantage is that we can directly observe all the chemical reactions at the electrolyte-electrode interface in real time, as they are happening during cycling of the battery." To do that, the team had to customize transmission electron microscopes for their needs. In particular, they had to overcome the damage done by the microscope's high energy beam: electron microscopes use electron beams to visualize what's in the field of view like a regular microscope uses light. The team determined the optimum way to shine the beam before getting damage. This allowed the researchers to charge and discharge the tiny battery repeatedly and be assured the changes they saw under the scope were due to battery operation and not the beam itself. Their experimental battery sported a platinum electrode and a commonly used battery liquid electrolyte called lithium hexafluorophosphate in propylene carbonate. The job of the electrolyte's positively charged lithium ions is to gather at the platinum electrode when the battery is charging, where they hold onto the electricity until the battery is used. And the lithium ions did their job. When the team pumped electrons into the battery, the lithium ions flocked to the electrode, which appeared to grow tufts of hair like a 1970s Chia pet. Discharging the battery deflated the tufts, but not completely. Further analysis revealed the leftover tufts could only be lithium metal based on their low density compared to the commonly reported electrolyte breakdown products. Losing free lithium ions to these clumps of "dead lithium" reduces the battery's performance. In addition, discharging left cracks on the electrode. More cycles of charging and discharging caused more cracks to grow and dead lithium to accumulate, some within the electrolyte and some on the surface of the electrode. Importantly, the researchers were able to measure the growth of a well-known layer on the electrode's surface that interferes with performance. Called the SEI for solid-electrolyte interphase, this layer forms due to interactions between lithium and the electrolyte. Eventually the SEI prevents the battery from taking a charge. The microscopic imaging revealed how quickly the layer formed and where. Although these experiments taught them about lithium behavior, Browning said he's more excited to apply the technology to study other metal anodes, metals such as magnesium, copper and others that might lead to a new generation of battery systems. "Once you can image this," he said, "why cycle a battery for days and days and days when you know how quickly the battery decays? Now we can cut down on cycling and move on to testing individual characteristics of new battery chemistries." This work was supported by JCESR, a DOE Energy Innovation Hub funded by DOE's Office of Science, and PNNL. Editor's note: An earlier version of this news release misidentified items in the captions and video. Reference: B. L. Mehdi, J. Qian, E. Nasybulin, C. Park, D. A. Welch, R. Faller, H. Mehta, W. A. Henderson, W. Xu, C. M. Wang, J. E. Evans, J. Liu, J. -G. Zhang, K. T. Mueller, and N. D. Browning. Observation and Quantification of Nanoscale Processes in Lithium Batteries by Operando Electrochemical (S)TEM, Nano Letters, February 23, 2015, DOI:10.1021/acs.nanolett.5b00175. The Joint Center for Energy Storage Research (JCESR) is a major partnership that integrates researchers from many disciplines to overcome critical scientific and technical barriers and create new breakthrough energy storage technology. Led by the U.S. Department of Energy's Argonne National Laboratory, partners include national leaders in science and engineering from academia, the private sector, and national laboratories. Their combined expertise spans the full range of the technology-development pipeline from basic research to prototype development to product engineering to market delivery. JCESR is a DOE Energy Innovation Hub supported by DOE's Office of Science.